Scotland can be sort of a funny place. Men wear skirts (though they'll surely tell you that it's a kilt), they're adamant that there's still a sea monster living in Loch Ness (I'm looking at you, Nessie), and, as soon as the weather creeps above 40 degrees and the sun peeks through the clouds, everyone, and I mean everyone, is outside. And they're not just out strolling the streets, walking on the beach, bundled, but happy. Sweaters come off, shorts come out, and suddenly, it's summer? I told you they were crazy. And the strangest part about this premature "summer" is their fascination with ice cream. I don't know about you, but the last thing I want on what I'd call chilly, they'd call balmy, day is a cold, icy scoop of mint chocolate chip. But hey. The heart wants what the heart wants, right? So, in the spirit of assimilation, I have a delicious- and shockingly easy- recipe for you. 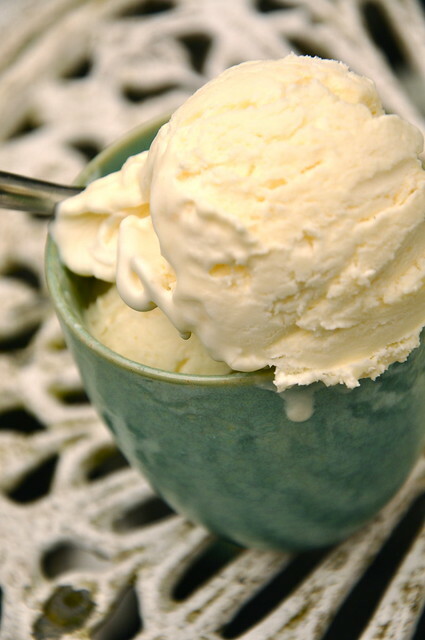 This ice cream is for those of you who, like me, don't have an ice cream maker tucked away in your cupboards. If I were home, I could've given you a much more complicated, much fancier recipe, but this is something I could work with. It's a cheat's ice cream, if you will. And it's super tasty. To make the lemon curd: In a saucepan, whisk together the eggs, egg yolks, and sugar until smooth. Place over low heat and add butter, zest, and juice and whisk continuously until thick enough to coat the back of a wooden spoon. Strain lemon curd through a sieve into a sterilized jar and set aside. 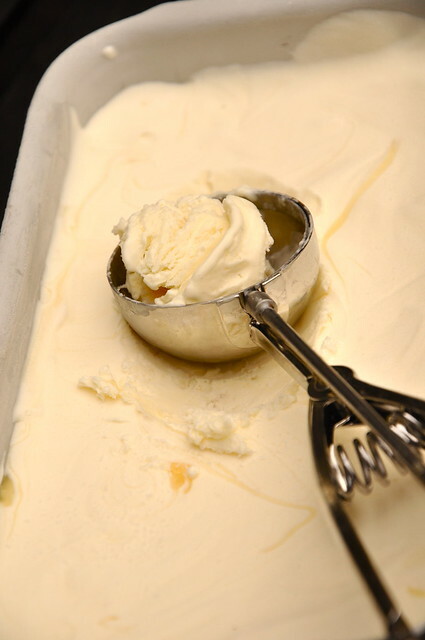 Though you only need 1 cup lemon curd to make ice cream, it will keep for two weeks in the fridge. 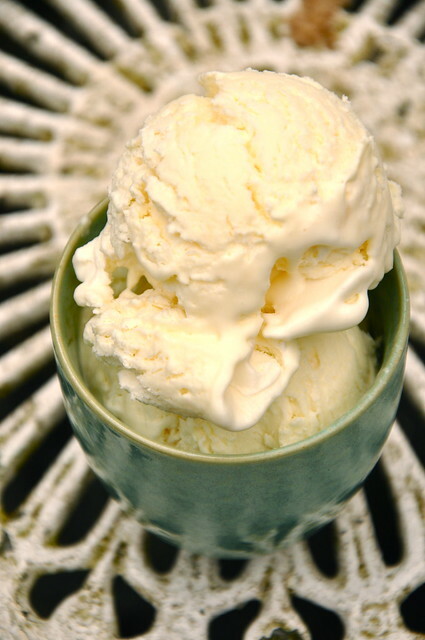 To make the ice cream: Pour sweetened condensed milk into a large bowl. In another large bowl, whisk the heavy cream until soft peaks form. 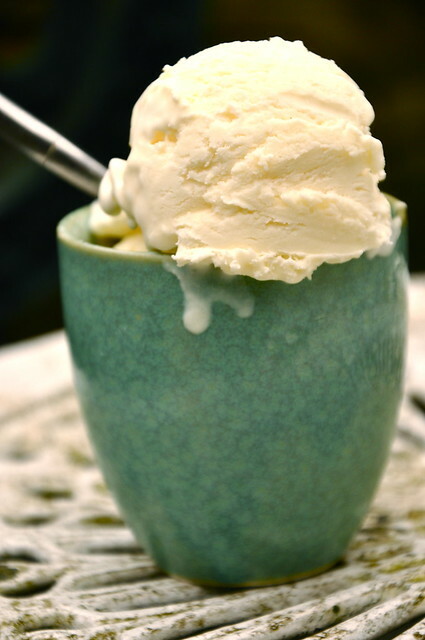 Carefully fold whipped cream into sweetened condensed milk. Put 1/4 of the cream mixture into a loaf pan. Dollop lemon curd on top and swirl into cream mixture with a knife. Repeat with cream mixture and lemon curd until you have used all of it. Cover with plastic wrap and freeze overnight. Allow to sit out for 5-10 minutes before serving.